Can I just say how much I love, love, fricking LOVE Kentucky? The food, the hospitality, the scenery, the bourbon… I just got back from two days in the Bluegrass State for work and pleasure, but mostly pleasure. So close to my Indiana home, but worlds away food-wise, I can totally get down with menus that boast newfangled twists on country ham, pimento cheese, hot browns and grits. Bring. On. The. Grits. First stop, an exploratory jaunt to Paducah, new territory for me. With a sweet walkable downtown, an interesting history and a booming arts scene, this charming river city makes a lovely first impression. I had so much fun exploring the cultural attractions here (p.s. the quilt museum is seriously cool! YES – QUILTS, people! ), and I loved my stay at the uber-urban 1857 Hotel. So…. Drinks. This is Bourbon Country, after all. I think my blood alcohol content automatically rises as soon as I cross the state line. Omigosh, do these people know their way around an Old Fashioned. Now, I’ve had some good bourbon knowledge dropped on me in the past five years or so, but I always look forward to learning about and tasting something new on my trips to Kentucky. Dinner was at the Freight House in Paducah, a modern American eatery that’s just a few months old. The menu here touts farm-to-table fare with an emphasis on Kentucky farms. That means pork rinds, vinegar-pickled cucumbers and onions (which my mom made every summer, and I’m sure yours probably did, too), frog legs. Note to self: Kentucky blue snapper is something I definitely need to know more about. So here’s what I ate. Shrimp and — say it with me — PIMENTO CHEESE GRITS. Adorable little pan-seared carrots topped with candied pecans, blackberries and a schmear of spicy dilled ranch sauce. A mustard-y deviled egg. Tomatoes from an employee’s own backyard. A bite of my dining companion’s non-traditional Hot Brown — an intimidating, but delicious, towering stack of thick bread, sweet tea-brined (!) chicken, creamy sauce, a vibrant red tomato slice and a piece of pork belly on top. Holy Moly. I’m ashamed to say I didn’t save room for dessert, but I was happily stuffed by this point. Breakfast the next morning at Kirchhoff’s… currently a local institution bakery/coffeeshop/deli/dress shop that’s been in operation here since the 1800s. So many pastries, bagels, tarts, pies, cookies, brownies… so little time. I was leaning toward a Chess Bar, that is, until I spotted the “Elvis” scones atop the counter. Banana, peanut butter, maple and bacon all in one treat, and somehow it works. Washed down with a large café au lait, and a snickerdoodle. Because… why not. We’re talking breakfast of champions, right here. Everyone I met talked this place up so much for lunch, I went back again at 1 p.m. and enjoyed half of a turkey sandwich on cranberry walnut bread and a bag of cheddar horseradish potato chips. My night in Louisville pretty much revolved around my stay at the Seelbach Hilton, whose bespoke setting inspired F. Scott Fitzgerald to honor the historic beauty in “The Great Gatsby.” If you’re overnighting here, or just passing through, I highly recommend sneaking a peek at the amazing lobby and the Rookwood-tiled Rathskeller in the basement. While you’re there, might as well grab a seat in the Old Seelbach Bar and order up a classic Seelbach Cocktail – bourbon (duh) with a splash of champagne. In the morning, I had the supreme pleasure of breakfasting with two of my favorite travel colleagues. Stacey gets credit for introducing me to my very first bourbon cocktail when I was in Louisville for a work trip over St. Patrick’s Day six or seven years ago, and Susan has been a fantastic resource for all the fun Kentucky assignments I get to write. They took me to Gralehaus… one part B&B, one part brewpub, one part breakfast/lunch café. All good. I dug my pretzel croissant breakfast sammie, laden with country ham, melty cheese and a sunny-side egg. Long live the Commonwealth, y’all. Last night marked my ahem-cough-snort-nd birthday, which called for celebration! I know some people would rather let their day come and go unnoticed, but I love me some birthday action. I’m not big on presents or a lot of elaborate stuff; for me, it’s just nice to be acknowledged. Plus, the IU vs. Kentucky NCAA playoff game provided an added excuse to gather some of my nearest and dearest besties at the house to hang out. 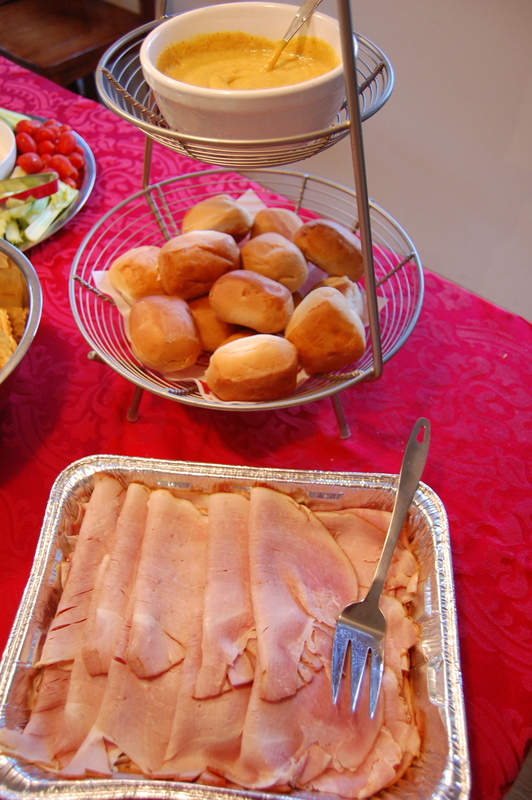 Mini ham sandwiches. I’ve been looking for an opportunity to order some bourbon-baked ham from Ralph’s Great Divide for awhile now. All they need is 24 hours to whip it up and slice it however you want. Highly recommend; this stuff was delish. As a non-Catholic, though, I totally spaced that this was a Friday during lent. (My bad!) We heathens who did eat the ham really enjoyed it. 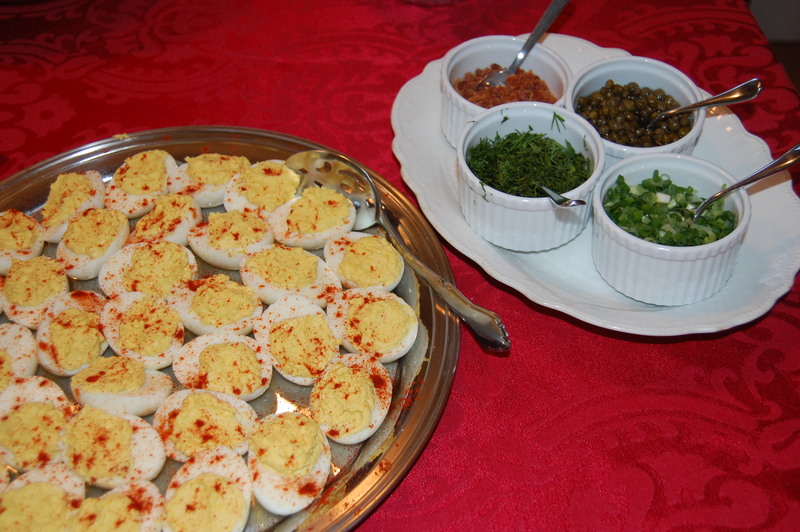 my deviled egg “bar.” Genius, no? Deviled egg bar. Libertine here in Indy has been garnering rave reviews for its deviled egg sampler with various gourmet toppings. I was all set to recreate the same type of thing until I hit on the idea of a “bar” that allowed guests to dude up their own eggs with a variety of do-it-yourself adornments. Since I needed things that would be ok to sit out during the party, I went with bacon “dust” (super crispy strips crushed very finely), chopped green onions, fresh dill and capers. I thought it was pretty ingenious, and who doesn’t like deviled eggs? Well, besides my hubby, of course. 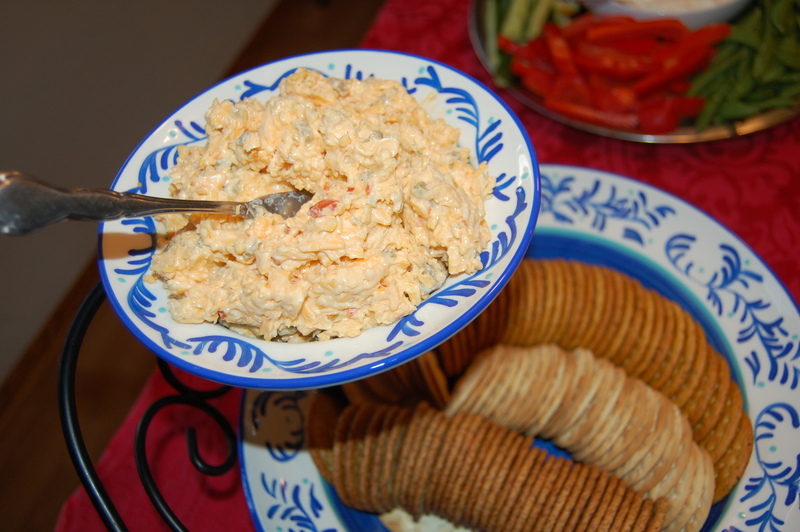 Pimento cheese. One of the new food trends for this year as declared by leading foodie magazines, I cribbed this recipe from an editor friend after sampling his contribution at a holiday party several months ago. It was easier to make than I thought, and sooooo tasty. I spread a big scoop of it onto some bread for lunch yesterday, and plan on doing the same thing again today. Crudite. 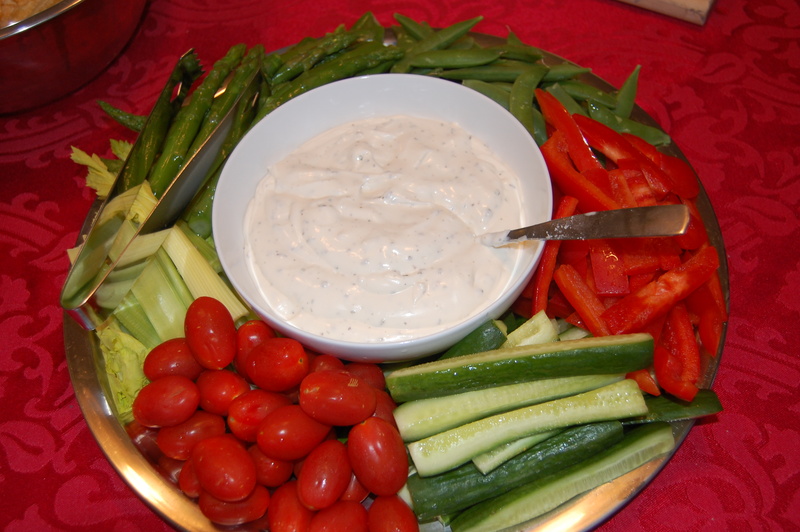 The classic party standby — veggies and dip. Always a crowd-pleaser, and always looks fresh and pretty if you assemble it yourself. Ditto for a nice selection of cheeses. It was a great gathering of friends, and a great night. Here’s hoping my ahem-cough-snort year will be the best yet! If you worked in downtown Indy back in the mid 1990s, chances are you remember Essential Edibles, a quirky and delicious little lunch spot unusually situated in the basement of an old Catholic church in the Lockerbie area. And if you were like me, you were sad to see it close in 1997. Fans can rejoice again — after years of private chef work, former EE owner Becky Hostetter is up and running again. Literally. Together with her business/chef partner John Garnier, Hostetter is cooking up a storm in her new Duos food truck. 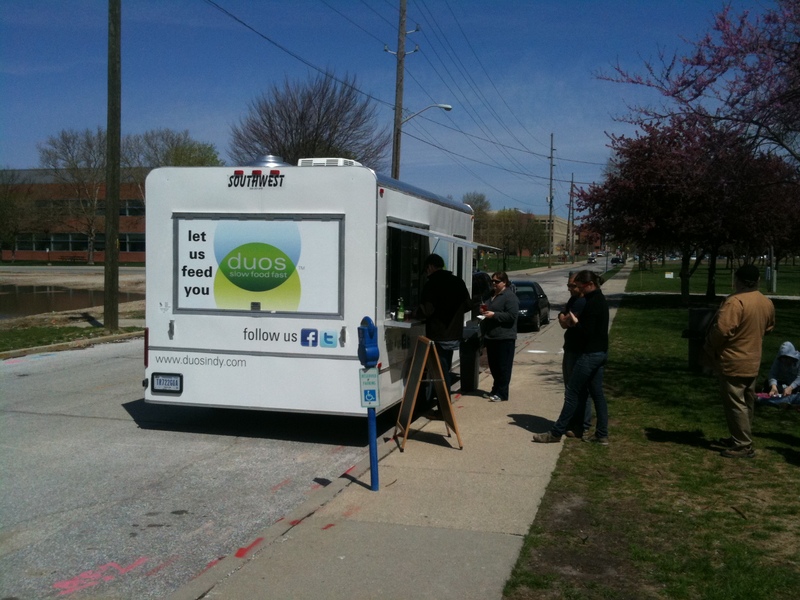 Customers log onto Twitter and Facebook to find the mobile kitchen’s location, dishing up lunch Wednesday, Thursday and Friday from various downtown parking spots; breakfast at the downtown farmers market; and occasional weekend meals in other destinations. What’s cool about Duos is that the chefs change up their short menu of gourmet soups, sandwiches and salads every week. And because Hostetter is a vegetarian and Garnier is a meat-eater, they make sure to offer something for everyone — usually a couple of sandwiches, several kinds of side salad, maybe a soup or two. Everything is organic and locally sourced as much as possible. I’d tracked down the truck with an editor friend on a blustery day back in March. The weather curtailed sitting outside on Mass Ave, so we ate in my car. The food was good, and we swapped tastes of everything — the Cajun meatloaf sandwich had a nicely spicy kick, but I preferred the Big Al’s sandwich, a drippy, gooey grilled Fontina cheese panini sort of thing with roasted red peppers, balsamic vinegar and basil. Yum. I revisited Duos on Thursday just this week, bringing hubby along for the ride. It was a little cool outside, but the weather was sunny and beautiful, and the Military Park location was perfect for enjoying an al fresco lunch on the downtown canal. We parked at the White River State Park garage, walked across from the Indiana State Museum and waited in a quickly moving line to get our food. On this day, our options included pimento cheese and herb roasted turkey sandwiches, wheatberry and orzo pasta salads, green gazpacho and asparagus soups, and an almond cake for dessert. 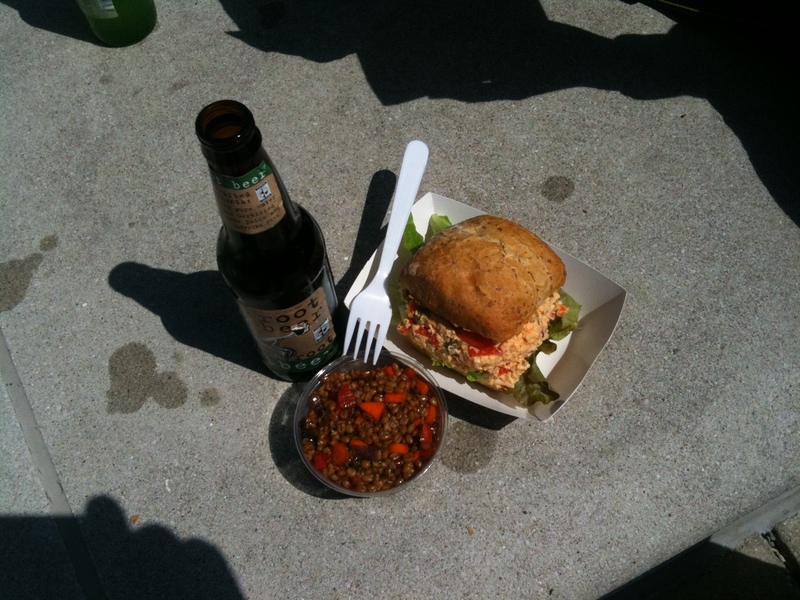 We decided to try both the sandwiches and salads, washed down with bottles of Maine ginger brew and root beer. Both sandwiches were served on the same hearty whole-wheat buns — hubby’s turkey contained thick slices of flavorful meat, avocado, lettuce, spouts and Jarlsberg cheese. He pronounced it delicious at first bite. 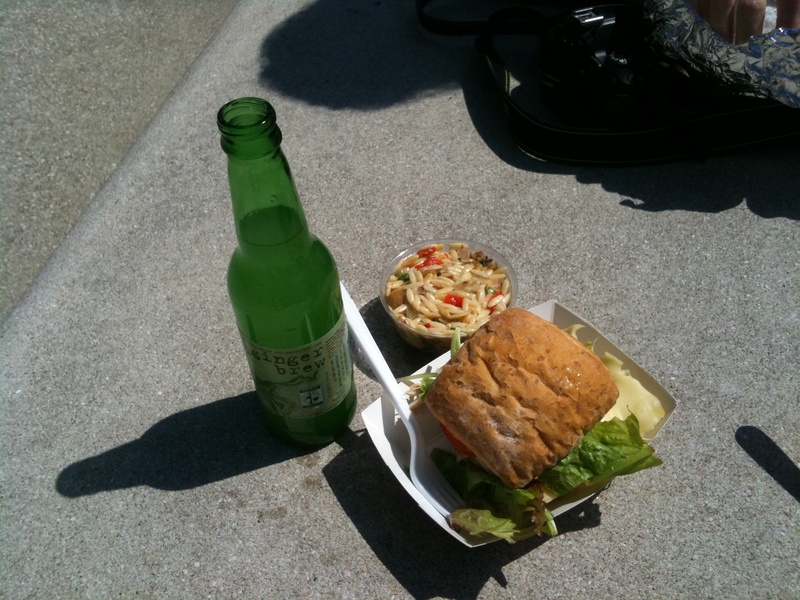 My pimento cheese sammy consisted of a generous scoop of the cheese filling with lettuce, tomato and a slice of onion. The cheese was yummy, but very heavily laced with olives. So much so that it was difficult to discern any other flavor. This was perfectly ok with me because I love olives, but the intensity of the briny saltiness might have been a little overpowering for some diners. Serving it on flatter bread and spreading it out a little thinner might have helped distribute the flavor a little more evenly. The salads were both awesome IMO – served in little plastic cups that looked deceptively small at first, but offered a surprising amount in the end. 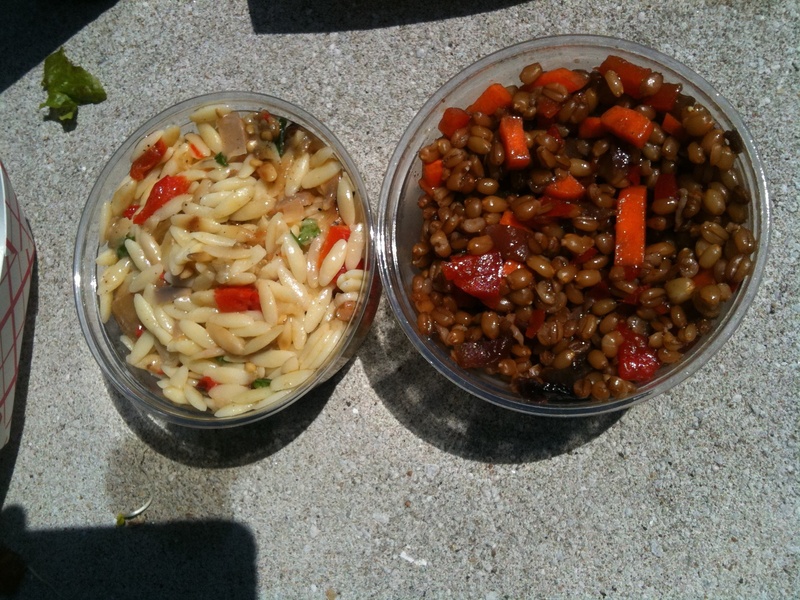 The delicious wheatberry salad was unlike anything I’ve tried before. Studded with small crunchy bits of organic carrot and red onion in a mild vinaigrette dressing, the chewy wheatberry grains were really satisfying. I loved it, as well as the orzo pasta with roasted veggies that reminded me of something similar I’d eaten at Essential Edibles back in the day. Hubby has a beef, though. I believe I may have mentioned his hatred of onions once or twice? Basically, if he even thinks he sees one, smells one or tastes one anywhere in a dish, it’s game over. He won’t even take a courtesy bite to be nice. So if there’s one thing he hates about dining out, it’s when onions make an appearance without forewarning. It’s ok when the menu advertises them in a dish, as he can then plan accordingly to avoid it. But when they just show up in something he was otherwise really looking forward to eating, he gets upset. Three out of the four items we ordered for our Duos lunch contained onions. My pimento cheese sandwich included a whole raw slice, which I picked off, but still immediately disqualified it from hubby tasting. (He claims that even if you remove the onion, it’s too late at that point, having already “tainted” the rest of the dish.) The salads both included small slivers of red onion, caramelized and soft so they weren’t raw, but offensive to hubby just the same. Sigh. I think the wheatberry salad mentioned an onion inclusion on the chalkboard menu, but the orzo pasta salad description just held a vague reference to roasted vegetables. I’m not trying to pick on Duos here, this actually happens to us quite frequently in restaurants. We try to remember to always ask when ordering, but sometimes we forget and get nailed. The point hubby wants to make is that he feels menus should alert diners to onions in any and all dishes, no ifs, ands or buts. I think he may start lobbying Congress for a full disclosure bill.